Located at the southern-most tip of the Baja California peninsula, where the warm waters of the Sea of Cortez collide with the wild Pacific, Los Cabos is an area of striking beauty and one of Mexico's top holiday resort destinations. Surrounded by a vast cactus desert and ochre-coloured mountains, the azure waters offer diving, sailing and swimming, and the area is a world-renowned Mecca for sport fishing and surfing. Los Cabos is an area made up of the two resort towns of San José del Cabo and Cabo San Lucas, sitting at either end of an 18-mile (29km) stretch of exquisite beaches sprinkled with exclusive luxury holiday resorts and championship golf courses, known locally as the Resort Corridor. San José del Cabo is the older and more traditional of the two resorts with the unhurried pace of a colonial Mexican village. Cabo San Lucas started as a simple fish ing village and is now one of the favourite beach holiday destinations of the elite, with high quality luxury services and an energetic nightlife. The majority of visitors base themselves in San Lucas or the Resort Corridor. Just offshore is the area's landmark and an impressive natural wonder, Los Arcos (The Arches), a beautiful, wave-sculpted rock formation. There are shops galore in the two towns and along the Resort Corridor, and shoppers will not be disappointed in the variety of clothes and shoes, gifts and souvenirs, furniture, jewellery, leather goods and speciality stores. Cabo San Lucas has the largest selection of shops, and also has imported American goods, an artisan's market and dozens of boutiques to explore while on holiday. There are numerous restaurants in Los Cabos offering a wide range of fare from Italy, France and North America, as well as some excellent local Mexican cuisine. Seafood is understandably popular and is offered by almost every style of eatery. Diners can choose between fine dining, local restaurants with dancing and live music, bistros, and casual eateries. The tourist-orientated Resort Corridor has a vast variety of fine dining options, while simple Mexican cuisine is best found in either San José or San Lucas. One of the best places to sit elbow-to-elbow with locals is Marisquería Mazatlán, which serves simple and delicious seafood. The after dark scene in Los Cabos is mainly located in Cabo San Lucas, which has a livelier atmosphere than the relatively laid-back San José and attracts a younger, more energetic crowd. The most popular nightclubs are El Squid Roe, Cabo Wabo, Zoo Bar & Dance, and The Giggling Marlin, while many hotels have popular clubs and bars. For a quieter evening out, there are also numerous places to enjoy soft music and a romantic atmosphere. Los Cabos has become one of the leading golfing holiday destinations in Mexico, featuring five championship courses and a wonderful setting for golf. 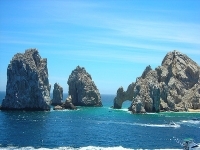 Los Cabos is also known as the Marlin Capital of the world, and is a favourite fishing destination for most of the year. Divers are never disappointed with the abundance of marine life, and whale watching tours operate between January and April. Watersport operators and hotels also offer sailing, windsurfing, surfing, water-skiing, and kayaking, as well as sunset cruises, snorkelling tours, and excursions to the natural rock formation known as El Arco. Other activities include horse-riding, bird watching, and spa facilities that offer fitness and pampering opportunities. Los Cabos can sometimes experience hurricanes and tropical storms. Hurricane season runs from June to November and visitors to the region during this time should take care to check weather and storm forecasts.